Welcome to The Teachers’ Lounge. 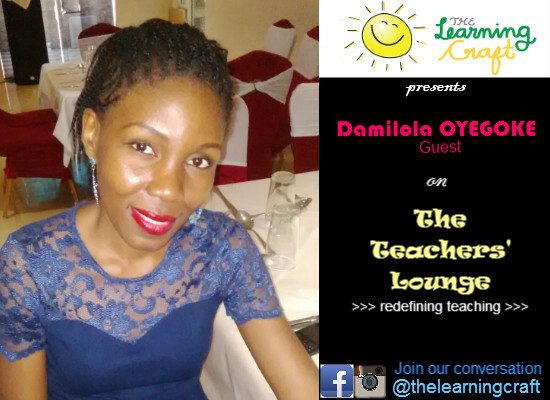 On this ‘Teacher Thursday’ we have Damilola Oyegoke as our second guest on The Teachers’ Lounge. Read her thoughts. Q1. What is your name/where you teach? A1. I am Damilola Oyegoke a teaching staff of Avi-Cenna International School. A2. Thinking back, my most memorable teaching moment was when a graduating student of Year 6 read out her speech on the podium of her favourite teacher and it was me! She remembered vividly all the things I used to do with my students when she was in my class in Year 2! My saddest moment was when a student of mine had an epileptic attack. I was so confused I burst out in tears! The parents had given me no prior information of the medical challenges their son had. A3. As a student, my best subject was mathematics. My dad made me love Maths, but my worst subject was Literature. My Literature teacher was weird! A4. Honestly, thinking about what I would be doing if I wasn’t teaching is quite difficult for me. Maybe banking, maybe singing or maybe a personal secretary. I honestly don’t know! Help! Q5. What do you teach? A5. Presently, I teach Numeracy, Literacy, Science, History, Geography and PSHE to Year 2 students. Q6. What do you teach? What inspires you….your ‘TEACHSPIRATION’? A6. Wow! My teachspiration is God and my parents. I do what I do because I have a calling and deep understanding that its what I am supposed to be doing. I feel so fulfilled teaching despite the discouraging salary. But God always compensates me with loads of benefits from the parents of my students. My parents have also been a big source of encouragement. Right from when I was a child, they instilled confidence in me, that I can be whatever I want to be because I will succeed in it. Q7. If I had the wheels to redefine teaching profession what will I do? A7. The first thing I would do is to make a law in that all teachers have their salaries paid promptly and adequately. I would make sure that accommodation and transportation for all teachers is top priority. Next, I will ensure that teachers experience constant and continuous on-going trainings. Q8. What does education mean to me? A8. Education is continuous and un-ending improvement of learning and learning experiences. Q9. What is my favourite book and why? A9. The Bible! It’s a book of stories that has soo much relevance in my life daily. Q10. What is the one thing you’d like parents to know about about teachers? teachers concerning the wholeness of their child both socially and academically.